Chevrolet has unveiled the 2015-MY Colorado mid-size pickup. Editor's note: View our "Chevrolet Colorado '15 Mid-Size Truck" photo gallery for detailed photos of the vehicle. 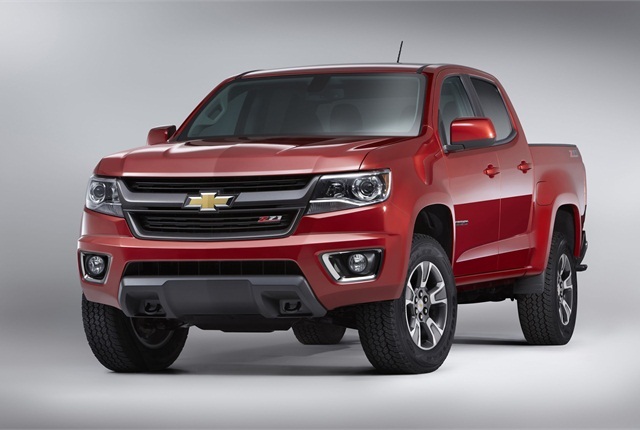 Chevrolet has reentered the mid-size truck market in the U.S. with the debut of the all-new 2015 Chevrolet Colorado. The new Colorado was developed specifically for the North American market. There will be three configurations of the 2015 Colorado — an extended-cab model with a 6-foot bed, a crew cab with a 5-foot bed, and a crew cab with a 6-foot bed. With the tailgate down, the 6-foot bed allows 8-foot-long items to be hauled within the vehicle. For fleet and commercial customers, Chevrolet is also planning to offer a rear-seat delete and box-delete version of the Colorado. The automaker is currently working with its upfitters to develop upfit options for the Colorado. According to Chevrolet, the Colorado will be ideal for several fleet-specific functions, including auto parts and light delivery, pest control, and light service duties. Chevrolet will offer three trim levels — the WT, LT, and Z71 trims — that will all be available in either 2WD or 4WD. The Colorado will be outfitted with a 2.5L I-4 engine as standard, which achieves 193 hp at 184 lb.-ft. of torque. A 3.6L V-6, which achieves 302 hp at 270 lb.-ft. of torque will also be available. During the 2015 calendar year, Chevrolet expects to make a Duramax 2.8L I-4 turbodiesel available for the Colorado. When properly equipped, the Colorado is expected to have a trailering capacity of more than 6,700 pounds. All capacities, including fuel efficiency, are currently pending. The Colorado features triple-sealed doors inlaid in the body sides, like the 2014 Silverado, for improved aerodynamic performance and a quieter interior, according to the automaker. To help keep overall mass down and improve the front-to-rear weight balance, the Colorado features a segment-first aluminum hood. It also features the segment's only active aero grille shutters, which close at certain highway speeds to enhance aerodynamics. The North American version of the Colorado is 900 pounds lighter, 16 inches shorter, 5 inches narrower, and 3 inches lower than the global version of the vehicle. Standard CornerStep rear bumper design introduced on the 2014 Silverado. Available EZ Lift-and-Lower tailgate that uses an internal torsion bar to make raising the tailgate easier with one hand, and a damper for more-controlled lowering. Standard two-tier loading that allows a platform to effectively split the bed into upper and lower sections, making it easier to haul, store and conceal items such as tools. Thirteen standard tie-down locations throughout the bed for use with available, movable cargo tie-down rings. Standard bed rail and tailgate protectors. Six standard air bags, including head side curtain air bags designed for occupant ejection mitigation. Large rearview mirrors and standard rear-vision camera system for greater visibility. A forward collision alert system is also available. Chevrolet unveiled the vehicle at the Los Angeles Auto Show on Wednesday, Nov. 20, 2013.